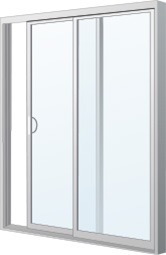 Meloche’s custom patio doors are available in a variety of sizes and styles. Its sleek appearance, durability and precision engineering, is designed for today’s generation and beyond. The sliding patio door is designed with fusion welded sashes that have a wood buck vinyl covered frame and aluminum sloped sill. There are a kick lock and key lock for added security and standard or upgraded hardware and decorative grill patterns.